Azure & Dakota at Folsom Ranch are hosting a model Grand Opening event on Saturday, Sept. 8 in Folsom. See how these new homes were brought to life featuring the latest designer-decorated finishes and unique pet amenities. SACRAMENTO, Calif., Sept. 5, 2018 /PRNewswire/ -- Taylor Morrison Home Corporation (NYSE: TMHC), a leading national homebuilder and developer, will host a model Grand Opening celebration at Azure and Dakota at Folsom Ranch on Saturday, Sept. 8, from 11 a.m. to 4 p.m. The Grand Opening will feature the "best of summer" fun with light barbecue fare, music, activities and model home tours. Located in Folsom's new highly anticipated master-planned community, these models offer home shoppers the first opportunity to truly experience Folsom Ranch firsthand. "See how easy living your Trademark can be at Folsom Ranch during our model Grand Opening celebration on Saturday, Sept. 8," said Tim Hearl, Sacramento division area sales manager for Taylor Morrison. "Featuring the ideal combination of location, design and functionality, Azure and Dakota are conveniently located near the Palladio and Hwy 50 and offer a unique opportunity for buyers to be among the very first residents at Folsom Ranch." A total of eight brand-new home designs are available, and a variety of generous included features are on display in the models including locally made alder cabinetry, 2"x6" exterior framing for added energy-efficiency, tankless water heaters and more. "These models also boast some of the latest design trends that can't be missed, such as navy-blue cabinets, custom home office spaces, upgraded tech packages, craftsman-style finishes and stunning owner's suites, as well as some unique dog-friendly features like an outdoor dog agility course that pet lovers will leap for," said Hearl. Priced from the high $400,000s, Taylor Morrison offers two stylish collections of single and two-story homes at Folsom Ranch—Azure and Dakota. Azure homes range in size from 1,784 to 2,768 square feet with three to five bedrooms, two to three baths and a two-car garage. Efficiently designed to maximize every square-inch, Azure homes welcome owners and visitors alike with inviting front entries, ideally located laundry rooms and spacious owner's suites overlooking the backyard settings. Highlighted by expanded living areas and pool-sized homesites, Dakota offers four home designs ranging in size from 1,891 to 3,063 square feet. Homes feature spacious center-island kitchens with generous pantries, first floor bedrooms, convenient owner's entries with built-in storage, and upstairs lofts in the two-story homes. A variety of options are available for personalization including multi-gen suites, GE® Monogram appliances, fireplaces, frameless showers, surround sound, floating shelves and more. Privately positioned at the back of the home, the sophisticated owner's suites feature dual sinks, free-standing tubs and expansive walk-in closets. Thoughtfully designed from the ground up, Folsom Ranch will offer over 1,000 acres of open space, 138 acres of parks and several new schools at completion that are all fully connected by over 30 miles of paths and trails. Easy access to Hwy 50 and premier shopping, dining and entertainment at the Palladio are just a few of the nearby attractions that residents will love. Historic Sutter Street is just a short drive away, and home to variety of antique shops, restaurants, boutiques, and year-round family activities including arts and craft festivals, an ice-skating rink, Folsom Live and more! There's no need to travel far for live theater and music – hosting some of the area's best headliners, the Harris Center at Folsom Lake College is located within a 15-minute drive from the community. "Folsom Ranch will no doubt be the 'place to be' in Folsom, so lock in your new home during the Azure and Dakota Grand Opening and be among the first to enjoy the Folsom Ranch life from the very beginning," adds Hearl. For more information on these new communities or to learn more about the Grand Opening event, please contact an Azure and Dakota community sales manager at (916) 686-7470 or visit FindYourTM.com. To visit the community, take Hwy 50 east and exit at E Bidwell/Scott Rd; head south on E. Bidwell and follow the signs to the sales center. 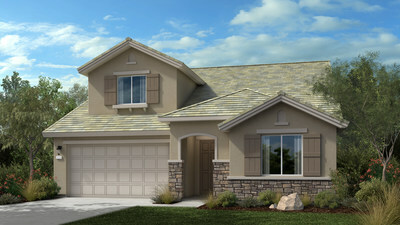 The Folsom Ranch sales center is located at 4312 Needlegrass Drive, Folsom, CA 95630. To receive the latest news about Folsom Ranch or any Taylor Morrison Sacramento community, visit TaylorMorrison.com or Facebook.com/TaylorMorrisonSacramento/.